1996 is the LOWEST Mintage SAE BU coin to date! 3,603,386 were officially minted in 1996. 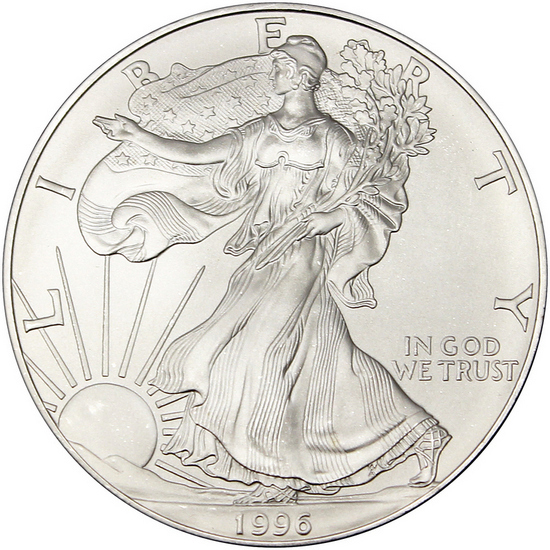 Silver American Eagle BU coins have been minted by United States Mints since 1986 in Unc/BU bullion strike. Backed by the US Government to have a $1 Face Value, each piece is official coinage (sovereign coin for the United States) and are also guaranteed to consist of 1 Troy Ounce of .999 fine silver. With 1996 currently being the lowest mintage year for the Unc. strike, these coins are highly sought after and bring a higher premium for collectors. Please note the conditions of these coins can vary as they are older coins. Each 1996 SAE BU coin purchased will arrive in a protective plastic flip.